What exactly is cross-site request forgery? According to many studies, cross-site request forgery, or CSRF, is amongst the top three most common vulnerabilities in web applications. Yet in spite of the prevalence of this common vulnerability, many developers are either unaware of the concept, or have difficulty grasping the severity of this vulnerability and the methods to prevent it. Here we will attempt to clarify the concept and explain some of the potential solutions and outline the ones which work and the ones which don't. What is Cross-Site Request Forgery? Let's say there exists a website called testsite.com, and this site has user accounts. It is given that an admin user is able to delete the user account for "bob" by visiting the URL testsite.com/user.php?delete=bob. If a non-admin user visits this URL, nothing will happen because they don't have admin privileges. Now when the admin of testsite.com visits this page, he won't see anything because http://testsite.com/user.php?delete=bob is not a valid image. However testsite.com still received a request, and if the admin is logged in, the action will be performed and bob's account will be deleted. This is the simplest form of CSRF. Typically the more interesting types of actions on a website will be performed using POST, so an img tag or hyperlink won't be a possible attack vector in most cases, but it's still possible to include auto-submitting forms and AJAX requests to perform CSRF. What Prevention Methods Do Not Work? The idea: Otherwise known as "security through obscurity". The concept is to create a cookie for the user containing some secret data such as an MD5 hash of the current timestamp. When the user visits a page with a form, the secret cookie will be set, and upon submitting a form, the backend code will verify that the cookie is set. Why it doesn't work: Cookies are part of every request. Once a user has a cookie set, it doesn't matter whether or not the user intended to send a request to the site, the cookie will be there either way. The idea: If the user has a session id then the user already viewed the page before submitting data to it. Why it doesn't work: While the above statement is true, it doesn't prove that the user viewed the page immediately before submitting the data for the same reason that secret cookies aren't valid proof, and additionally it proves absolutely nothing in the case that the target website has an XSS vulnerability to use as an attack vector for the CSRF attack. The idea: Only use POST requests for performing data-altering actions. This will prevent img tags and hyperlinks from being usable as attack vectors. How Can I Effectively Prevent CSRF? There are a number of effective solutions, each with differing technologies, constraints, and weaknesses. The solution generally accepted as the "best" is the Synchronizer Token Pattern. We'll begin by explaining the most common implementation of this popular design pattern, and then go into some detail on alternative solutions. This design pattern is typically considered the recommended technique for preventing cross-site request forgery attacks. It has a handful of different implementations, but the common attribute of each of them is the presence of a unique 'token'. The most common implementation of the synchronizer token pattern consists of generating a unique token for each user and storing it in the session. When displaying a form or sensitive URL, this token should be included as a hidden input, GET parameter, or posted in some other way along with the other POST data. Here is an example of a basic framework for CSRF prevention using synchronized tokens in PHP: PHP CSRF Prevention Framework. One somewhat effective measure for preventing CSRF is to include a challenge for the user such as a CAPTCHA or requiring the re-entry of the user's password. When these techniques are properly implemented, they can prevent CSRF fairly successfully, however it isn't always feasible to include a challenge in every request, and it can have a negative impact on user experience. Referer is generally considered a weak identifier. While it's quite easy to spoof the referer, it's not possible in the context of a CSRF attack, and additionally the method requires no memory usage for things such as sessions. However, this technique can be circumvented on GET requests using a redirect vulnerability. Additionally, it should be noted that https domains do not send the referer header when the destination is not also https. It should also be noted that many browsers don't send the header at all, or that sometimes users like to set their own website as the referer so that their link will appear in a site's logs. Under this circumstance, a user who legitimately intended to perform an action would be rejected. [One] approach to solving CSRF is to send a "Same-Origin" header with requests, setting its value to "YES" if the referrer is of the same origin as the requested content and "NO" otherwise. While this one-bit approach can be effective against CSRF, it doesn't seem robust enough for deployment. Some sites post data cross-site when they own multiple domains. Additionally, a state-changing request might not be actually intended: an open redirect might be exploited, thus spoofing the content submission. Nearly all of the above-mentioned techniques can be easily circumvented when an appropriately significant XSS vulnerability is present on the target website including the synchronizer token, checking referer, and checking the origin header. Only the challenge-response technique is safe from an XSS attack vector. Assume you have a page on your website, testsite.com/test.php. 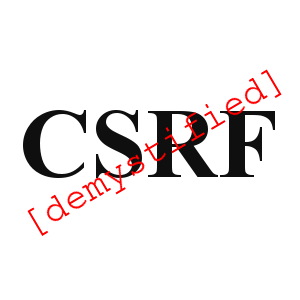 Here we have a hard-coded CSRF token to simplify the demonstration. If you try out this experiment yourself, upon accessing this page, you should see the text "Successful post". I like the article, but i'd show more examples. I felt that for beginners this could be a good thing. But the theory is very well explained.